My mother, Mimi the 1st, used to make orange muffins for Sunday breakfast. She probably used a Betty Crocker mix..They were the newest kitchen craze, and she kept a pantry full. Anyway, the mix is not available now, so a few years ago, I tried to reproduce it. I learned that the flavor comes from using the whole orange, but even though I had success..I never wrote the recipe out! Sew, this morning I am attempting to recreate them... Cooking and baking is so much fun now, with access to millions of recipes, along with reviews, comments, and funny disaster stories. Google it, read through a few recipes, then tailor your attempt to what you like, how much time you are willing to spend, and what you have in the pantry..
Pam (the wonderful daughter in law) had purchased a box of sunkist navel oranges...so I washed one, cut the thick ends of and tossed them out, cut the rest in chunks and pureed them in the food processor. The recipe I referred to was for a bisquick banana muffin, It called for an egg, and 1/3 cup sugar, so I added that to the orange, still in the cusinart, and mixed it up. One thing I know about baking muffins is you don't want to over mix them, so I added the 2 cups of bisquick and mixed it using the "pulse' button..on and off, just long enough so that it was blended. The recipe said to bake in a muffin pan w/ paper liners at 400 degrees.I use the convection setting on our oven for baking. I like the evenness (word?). I thought that was hot, but did it anyway. Into the oven, for 15 minutes.....As I went back to my computer to check the time, I realized that the recipe also called for 3 tablespoons of vegetable oil ! Oh, well, too late... funny disaster story ? So the good news... you don't apparently need the oil! The muffins are very good, although they could be alittle sweeter. A drizzle of icing might be a good addition.. I ate one still warm, and another once it had cooled, and the flavor is better when it is room temp. They rose nicely and browned... I'll have to eat another for lunch..just to make sure they are okay for the family. 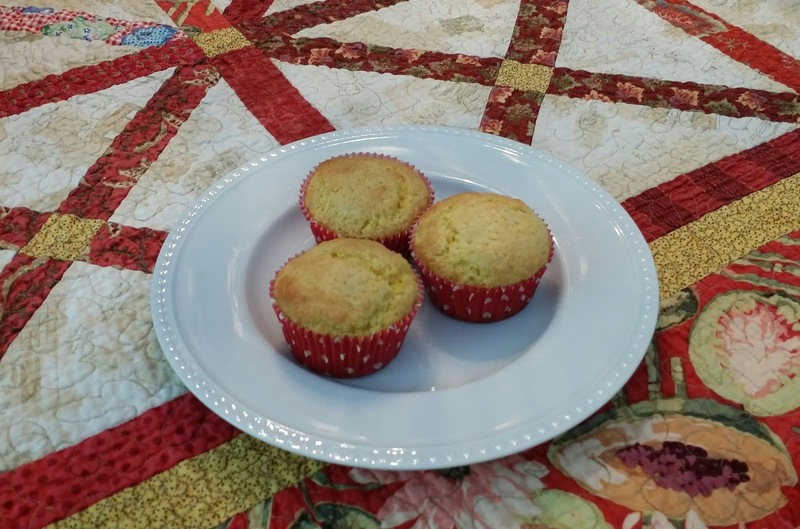 For my quilting friends...we use a quilt as a tablecloth everyday for every meal. 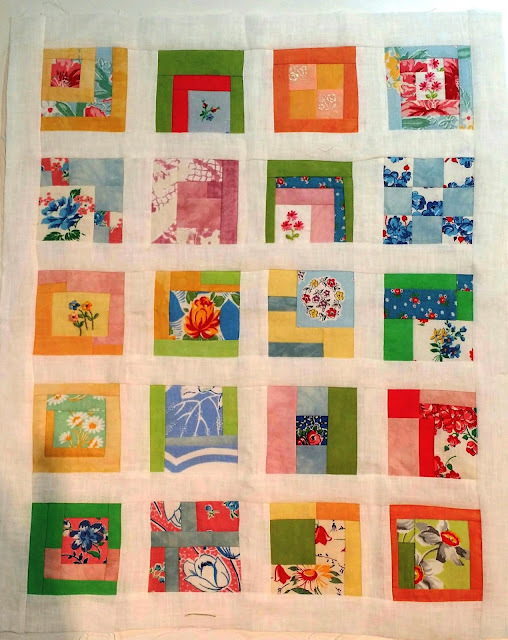 Quilts made well, machine quilted and best quality fabric, will wear well when machine washed and dried. Use that quilt and enjoy it.. If you made this quilt in a class with me...please take a picture and post it in comments!